The Atari 2600 is a video game console released in October 1977 by Atari, Inc. It is credited with popularizing the use of microprocessor-based hardware and ROM cartridges containing game code, instead of having non-microprocessor dedicated hardware with all games built in. 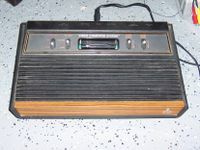 The first game console to use this format was the Fairchild Channel F; however, the Atari 2600 receives credit for making the plug-in concept popular among the game-playing public. Source: Wikipedia, "Atari 2600," available under the CC-BY-SA License.